Lots of options, but which cutter works best? The late, great, comedian George Carlin once said that life was about acquiring “stuff”. This is especially true for cigar smokers. To us, the need for “stuff” seems endless. Aside from continually buying cigars, we also need humidors, ashtrays, lighters, hygrometers, humidifiers, and above all, cigar cutters. Unless we want to look like Clint Eastwood in The Good, the Bad, and the Ugly, it’s best not to bite off the ends of our cigars. Instead, we more civilized folks prefer using cigar cutters; instruments designed to do one thing, and one thing only: to cut off the ends our cigars. Being of singular purpose, these precision instruments generally work well. But not all cigar cutters are created equal. Some are actually punches, and puncture rather than cut the cigar cap. Others look like small pruning shears, and use a scissor action. And then there is the “V” cutter, slicing a groove into the cap. There is no “correct” way to cut a cigar, and it’s simply a matter of personal preference. However, this article will focus on the most popular kind, the guillotine cutter. And like its name implies, its design dates back to Marie Antionette. Sharpness: This seems like it would be obvious. After all, a cigar cutter is a knife, and the sharper the blade, the better the knife. But I’ve seen some scissor type cigar cutters that were dull beyond usefulness. These would squash, rather than cut a cigar. But generally, all guillotine cutters, even the promotional freebies, have sharp blades. Here the playing field is pretty level. One blade or two: Guillotine cutters fall into two categories: single or double blade. It has been my experience that the double blade cutters work better. Even with a razor-sharp cutting edge, a single blade cutter tends to squash the cigar as it cuts. With the introduction of a second blade, a cutter’s performance greatly improves. There is less compression when two blades work at opposing angles, and less compression means better draw. Common sense would assume that a two-blade cutter would be more expensive than one with a single blade. But that’s not true. The single blade Siglo Seki Cutter retails for $141.00, while the majority of twin blade cutters are under $20.00. 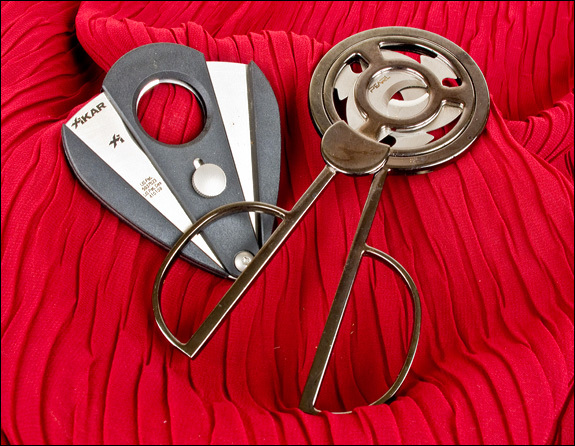 One cutter worth mentioning is the Palio cutter ($44.95 retail). Although it’s got two ultra-sharp blades, its design acts more like a single blade cutter. Each blade is fixed to the body of the instrument; not “free floating” like some quillotine cutters. This design compresses the cap against the oversized body of the cutter. 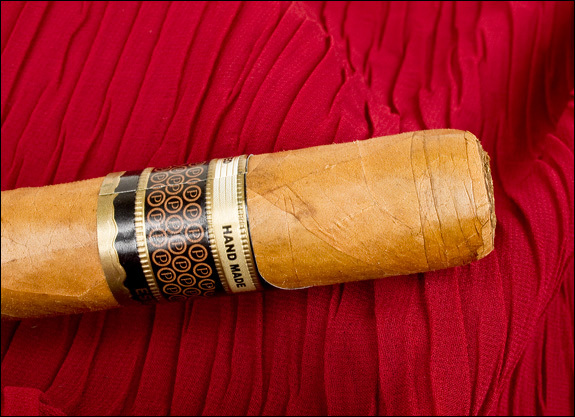 Cigars cut with the Palio seemed to have a slightly diminished draw compared to other quillotine designs. The perfect cut keeps the cigar from unravelling. Design: Getting the perfect guillotine cut can be difficult. Too deep a cut and the cap might unravel; too shallow and the cap can feel rough on the lips. The best cut is one that removes a portion of the rounded cap, but leaves the wrappings intact. This can be accomplished with good eyesight and hand-eye coordination. But in dim light, or questionable dexterity, the perfect cut can be a difficult task. These days there is no reason to even think about such trifles. Cubancrafters.com offers a number of cigar cutters that make things a whole lot easier. Their Perfect Cutters have a closed end that serves to measure the perfect cutting depth. Simply place the cap against the stopper and make the cut. Voila! A perfectly cut cigar! If you’re smoking a figurado , the Perfect Cutter has a hole to accommodate its pointed cap. 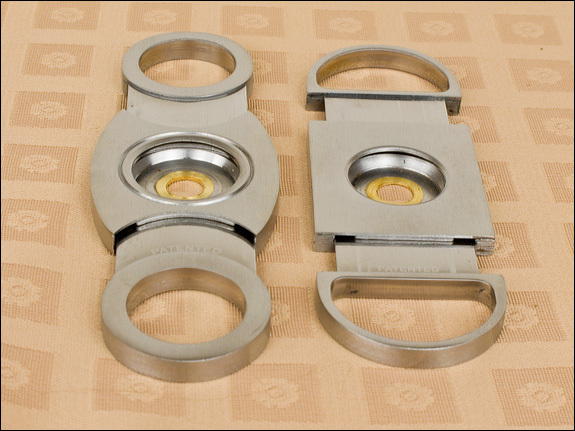 Cubancrafters offers a number of different styles of Perfect Cutters. I’ve discovered that the model with the square shape gives a slightly shallower cut than the others. All the Perfect Cutters I’ve tried performed well, but beware of plastic cutters with this design. They tend to flex while cutting, and don’t perform as well as the rigid metal devices. With cigar cutters, reinventing the wheel is unnecessary. Exotic designs: There is one unusual style of guillotine cutter that, on the surface seems like a good design. This is the Revolution cutter. It’s got three blades that slice the cap in a rotary fashion. But this cutter has issues. First is its scissor design. This prevents the blades from having good downward pressure while making the cut. Secondly, tobacco tends to get jammed between the rotary blades, causing the cutter to seize. And thirdly, the original Cubancrafters models had poorly welded handles. This led to failure after only limited use . Of the three Revolution cutters I’ve owned, all had failed. The Revolution design appears to be a copy of the expensive Tsubota Pearl cutter. I have both versions of this, and neither of them gets much use. They reside in the drawer with the other cigar-related “junk” I’ve collected over the years. Teardrop cutters: These cutters are a relatively new design. They are similar in action to the standard two-blade cutter, but have a clamshell type mechanism. The cutter is opened with a spring-loaded button, and you cut the cigar by squeezing two handles together. In theory this should work well, but I find these cutters a bit clumsy to use. Plus it is hard to make a precision cut because the device doesn’t fit comfortably in the hand. It is also more difficult to cut multiple cigars quickly; they lock after each cut. 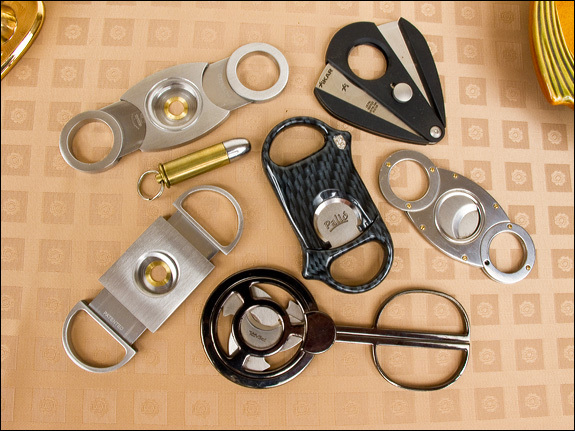 Recently, a number of new, innovative cigar cutters have hit the market. 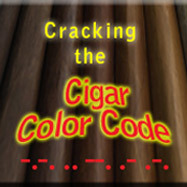 Cigar Aficionado has a great article called Cigar Toy. It describes all sorts of cigar cutters, and is a fun read. And the winner is… After many years of trying all sorts of gadgets, I find myself relying primarily on the Cubancrafters Perfect Cutter. It gives the perfect cut, each and every time. And no matter how dark the lighting, or how intoxicated the smoker, cutting the cigar doesn’t get any easier or better. And at $14.99, it’s an investment whose value is far beyond its cost. And Cubancrafters has a lifetime guarantee. If it ever gets dull or breaks, send it back for a free replacement. These Perfect Cutters work great. The one on the right gave the shallowest cut. When it comes to cigar cutters, it’s not necessary to reinvent the wheel. A simple design dating back 200 years still works best. And being one of the least expensive options, the Perfect guillotine cutter is a great way to start a cigar! I agree with you, The “Perfect Cut” cutter from Cuban Crafters works real well, everytime, every cut, without fail. Two questions; What about Torpedos, what then? And what is your opinion about the “Shuriken cutter?? I have never had the opportunity to use one or seeing one used, but i would think that with all those blades in there, 6 i do believe That they would mangle a cigar. I could picture them being used by the V.C. back in the days of “Nam” as a torture device. Put them on the end of your fingers and instant ground finger tip souffle’. Please let me know what you think, and what you recommend for the torpedo’s. Hello,SSS! Thanks for all your comments. To answer your question about torpedos and the Perfect Cutter…the thing has a hole in the back, allowing the point of the torp to poke through. That gives a shallow cut, but repeating the procedure will cut your torp even further. It’s super easy and fast. Also, the Shuriken cutter looks scary to me. I hate the way I can hear the cigar crunch as it’s pushed into the cutter. I havent actually used a Shuriken, but the videos are not encouraging. I wouldn’t want to chance ruining the fragile cigar wrapper. Thanks for this article. Made my decision easy! Out of laziness I love the one sided cutters. But for the most part I’m a punch guy. Robustojoe great stuff! We’ve been dipping our toes into the world of cigar cutters and the range of styles and options almost puts your head in a spin, like you’ve gone puff for puff with the heavyweights! Robustojoe great writing. 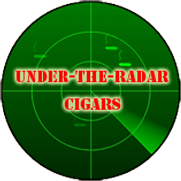 All of them I like Cuban crafters and my all time favorite is Xikar Xi2 Cigar cutter.